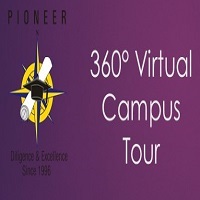 Pioneer Institute is a research center for Management since 2005. Click Here to see information about Doctoral Entrance Test (DET), Faculties, Subjects, No. 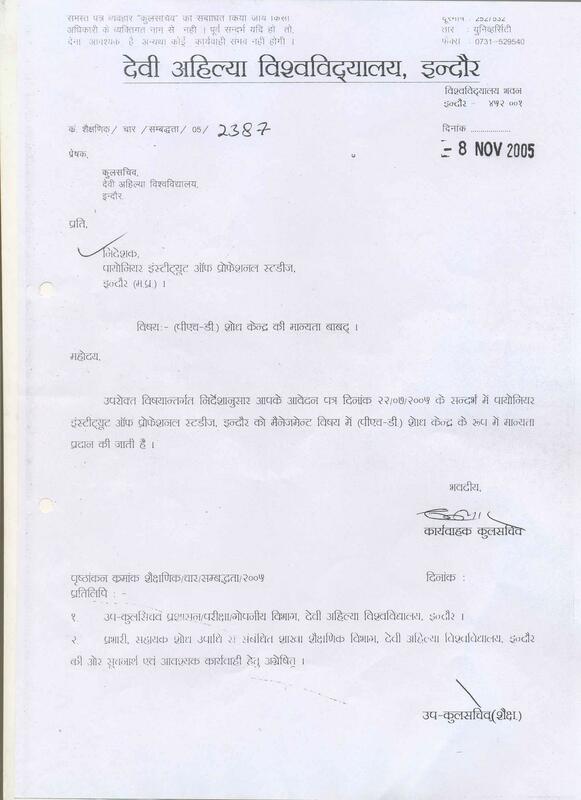 of Vacant Seats and Venue of DET Centre as notified by Devi Ahilya Vishwavidyalya, Indore. Click Here to see the new Ordinance no.18 for Doctor of Philosophy in Management as notified by Devi Ahilya Vishwavidyalya, Indore. Click Here to see the Syllabus applicable for Entrance Exam for Doctor of Philosophy in Management as notified by Devi Ahilya Vishwavidyalya, Indore. 1. The Ordinance shall come into force with effect from the date of its notification, With the enforcement of this ordinance, existing ordinance shall be repealed. 2. No Ph.D. scholar shall join any other course/study or appear at any other examination leading to a degree (except Certificate/Diploma course in languages, Research Methodology/Statistics/Computer Application) during the course of his/her Ph.D. programme. 3. A candidate for the degree of Doctor of Philosophy must, at the time of application, hold a Master’s degree in the concerned subject with at least 55% Marks ( 50% for SC/ST/Physically disabled candidates )or an equivalent grade of M. Phil Degree of the university, a deemed university or other university incorporated by any law for the time being in force and recognized by the University. Provided that a candidate who has at least seven years experience of research/teaching with at least five papers published in standard journals, may be permitted to get registered for Ph.D. degree, even if he/she posses minimum 50 % marks at Master’s degree. 4. A candidate shall ordinarily be permitted to work for Ph.D. Degree in the subject in which he/she has obtained his/her Master’s Degree. Provided that research work leading to Ph.D. Degree may be allowed in allied subject of interdisciplinary nature of the same faculty or of allied faculties. In such cases, candidates may be permitted to work under one or two co-supervisors along with the supervisor. 5. Candidates shall be generally admitted through an entrance test followed by an interview. 6. Candidates who are qualified in National Level Test such as NET/GATE etc. and State Level test such as MPSLET, accredited by the UGC of Teacher Fellowship holders or holders of M.Phil Degree though Entrance Test shall be exempted from the entrance test. 7. The university shall annually decide well in advance the number of seats available for Ph.D. programme in each subject. The number of seats, so decided, shall be notified by the university on its website and/or through advertisement in the beginning of every academic year. 8. A supervisor shall not have at any given point of time, more than eight Ph.D. scholars. Provided that the number of candidates registered with the Co-supervisor shall not be counted for the number of candidates under a supervisor. Provided further that a person shall not be allowed to supervise more than eight scholars at a given point of time although he/she is registered in more than one subject/discipline/institution. 9. While assessing the number of vacancies under a supervisor, the actual date of submission of Ph.D. thesis under his/her supervision shall be taken into account. a. In response to the advertisement or notification of the university,candidates desirous of seeking admission to Ph. D. programme shall be required to submit applications on prescribed from obtainable from the university on payment of prescribed fee. The duly filled application forms along with supportive documents and the Entrance Test Fee should be submitted/sent to the office of the Registrar within the given period. b. Candidates shall be admitted through the Doctoral Entrance Test (DET), which shall be conducted for each subject separately at the University Teaching Departments. Provided that the colleges, which are approved research centres, shall be allowed to conduct the DET for the subjects not available in the University Teaching Department. Provided further that the Kulpati may assign to the allied or to any Teaching Department to conduct the DET for the subjects available only in the colleges. Note: - The HOD/Principal will be the coordinator. 4 To submit the final list of candidates. The Entrance Test shall comprise of one multiple choice objective type paper having one hundred questions of one mark each covering all the basic papers of the concerned Post Graduate course of three hours duration to assess the fundamental knowledge of the candidate. The question paper should be prepared by a panel of examiners recommended by the Examination Committee of the concerned subject. There will be no negative marking. The candidates must score minimum 40 % marks ( 35 % for SC/ST/Physically handicapped ) to qualify the Entrance Test. A merit list shall be prepared by the committee on the basis of the result of the entrance test and submitted to the Registrar and notified accordingly. The successful candidates of the entrance test shall have to appear for an interview. The interview Board shall consist of all the members of the Departmental Research Committee (DRC) along with four subject supervisors nominated by the Kulpati taking minimum two supervisors from the colleges. The candidate are expected to discuss their research interest/area, choice of supervisor and co-supervisor, if any and tentative title of the thesis. The Board will assess the research potential of the candidates. The Committee shall finalize the list of the candidates admitted to the Ph.D. programme in the concerned subject. It shall also allot the Research centre, Supervisor and Co-Supervisor, if any, and approve the tentative title of the proposed research work. The final list should be immediately submitted to the Registrar. After the approval of the Kulpati, the list shall be notified. Note:- (i) While granting admission to students to Ph.D. programmes, the committee will pay due attention to the State Reservation Policy. (ii) The committee should also see that only the predetermined number of students shall be admitted to Ph.D. programme. Chairman and two other members form the quorum. The allocation of the supervisor for a selected student shall be decided by the DRC in a formal manner depending on the number of students for supervisor, the available specialization among the supervisors and the research interest of the students as indicated during the interview. The allotment/allocation of supervisors shall not be left to the individual student or supervisor. i Research Methodology, which may include quantitative methods and computer application. ii review of published research in the relevant field. (b) The course work shall be conducted in the University Teaching Departments / Colleges / Research centres as approved by the Vice chancellor. (c) A combined course work for M. Phil/and Ph.D. students may be conducted for a single/group of subjects wherever possible. (d) If found necessary ,course work may be carried out by doctoral candidates in sister Departments /Institutes either within or out side the University for which due credit will be given to them. (e) A candidate shall be declared to have successfully completed the course, if he/she obtains minimum 40 % passing marks separately in (a) ‘i' and ‘ii’ above. The course work shall be evaluated by the Examiners as approved by the Vice Chancellor. (f) If a candidate fails to obtain the minimum passing marks, he/she should be given one more chance. For this, he/she has to pay an examination fee as decided by the University. (g) If he/she further fails to obtain the minimum passing marks, he/she should be out of the course. a. After successful completion of the course work, the student is required to submit the Registration form within two months of the declaration of the result. The Registration form will be obtained from the University by depositing necessary fee. scheme of Teacher fellowship will not be required to pay the above fee except the registration fee. c After payment of fees along with the form of application the candidate will be provisionally admitted, provided that the application is found in order on being scrutinized by the DRC. (ii) Dean of the Faculty. (iii) Head of the University Teaching Department/School of Studies in the subject. (iv) Chairman, Board of Studies in the Subject. (v) One external subject expert of the rank of University Professor to be appointed by the kulpati, ordinarily out of a panel of 5 experts given by the Chairman of the Board of Studies concerned. The term of panel shall be coterminous with the Chairman Board of Studies. External expert and two other members shall form the quorum. Note:- (1) On the request of the supervisor, Kulpati may permit him/her to be present as an observer during the oral presentation of his candidate. (2) No T.A. and D.A. shall be payable to the candidate and the supervisor for attending the Research Degree Committee meeting. e The committee shall recommend suitability of the topic of research and the registration of the candidate for the Ph.D. degree. On approved by the RDC, the candidate shall be registered and enrolled as a student from the date the Head of the Department /School of Studies/College/Institution forwarded the application or the date on which the candidate deposit the registration fee, whichever is later. He will also be required to pay regular tuition, library and laboratory fees (six monthly) during his research tenure. Provided that if the RDC approved the topic and suggests a minor change, the candidate shall be allowed to submit a revised synopsis through the chairman BOS or Dean of the faculty or by the both. (a) Minimum one Research Paper published or accepted for publications in a referred journal. (c) The Certificate from the Supervisor together with Co supervisors, if any, that the thesis fulfills the requirements of the ordinance relating to the Ph.D., degree of the University (Appendix-IV). (d) The candidate shall also remit with the thesis a prescribed examination fee. On receipt of the thesis along with the certificate and fee it shall be sent to the examiners. (a) It must be a piece of research work characterized either by the discovery of the facts or by a fresh approach towards the interpretation of facts in either case it should evince the candidate’s capacity for critical examination and sound judgment. (b) It must be satisfactory in point of language and presentation of the subject matter. a) Rs. 600/- for every six months. Candidate has to appear for the Viva-Voce/Presentation in front of the examiner(s) appointed by University on the date fixed for that. After recommendation of the examiner(s), the Executive Council of University will award Ph.D. Degree to the Candidate.